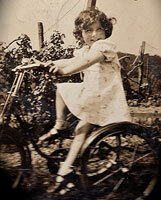 Marian came from a family which included a range of craftsmen from silversmiths to home knitters. She demonstrated her artistic skill from an early age and also formally studied oil painting, but it would be in the fields of textile dyeing and fashion design, where she had received no classroom training, that her international fame was to be achieved. In these areas she was entirely self-taught, working alone, and initially at home while simultaneously bringing up a young family. Progress wasn't always straightforward. She once described it as: “Some things started as beautiful accidents and then I would have to learn how to control the process, but that was the excitement of working with dyes and textiles.” Well it did pay off and her underlying artistic skills and her determination brought her recognition and eventually fame. Marian was born in 1937 and grew up in the north of England near Preston, a major textile town for over 200 years until the decline of that British industry in the second half of the 20th century. However she left home and its textile connection to train as a schoolteacher, and it would be several years later and on the other side of the world that she would rediscover textiles and start her artistic journey. With two small children at home and a family to manage, she remembered a short class in coloring textiles while training to be a schoolteacher and thought: “I could try that in my kitchen”. Thus was the beginning of her work with dyes and textiles and within a year or so she was selling wall-hangings and then had her first one-person exhibition in a gallery in Sydney, Australia. Although the techniques she was using can be found in similar form in several cultures across the world, she classified her work with a term from South East Asia - plangi. Part of the technique she was using would very soon gain pop-status as tie-dye, and that expanding interest in colored textiles would add another dimension to Marian's work. Quite coincidentally in 1967, Marian and her family were moving to the San Francisco area of California and it was here that the “gentle people” were gathering and a new enthusiasm for textile arts was developing. The hippie movement brought among other things a new desire for color, particularly in clothing and textiles, and Marian's mastery of the techniques shone through. Her hangings began to sell well through galleries and agents, first in San Francisco and then other major cities in the USA. And so her reputation developed. Then her work was seen by Nancy Potts, the set designer for a new musical called “Hair”, which was to become a breakthrough event in the theater. Marian was contracted to provide fabric for sets and costumes for the famous rock musical. This event, probably more than any other at that time, was to have a valuable impact on the family finances, and two years after arriving in the USA virtually penniless the family was able to purchase their first house in the hills above the small town of Los Gatos. Through the early 1970s Marian's work continued as predominantly dyed textiles, particularly silk, and her skill was recognized by the art community with individual and group exhibitions across the USA. In 1975 Marian spent a year in Iran and during that time Marian searched the bazaars and other local resources for interesting materials. This led to an expansion of ideas. One in particular used “donkey straps”, which was cotton webbing for strapping the load onto a pack animal. Marian dip-dyed and then manipulated the strapping into various art forms. These experiences, along with later trips to India and Japan, expanded her creative spectrum and resulted in a much greater variety of work during the last half of the 1970s. At the same time she continued to sell her hand-dyed fabrics to several designers for stage and screen including Bob Mackie in Hollywood and Cecil Beaton in London. Her materials became so well known that eventually she was contacted by fashion designers such as Mary McFadden and Giorgio di Sant'Angelo, and this would be the catalyst for a major change in Marian's artistic life. To quote her comment at the time: “If they can take my fabrics and turn them into fashion garments, why can't I?” And so toward the end of the 70s Marian started a brand new adventure. Marian was an artist and in the same way she went from painting into textiles so would she now expand into fashion. She had no dressmaking skills and therefore had to find local seamstresses, working from their homes, to do the cutting and sewing. In the beginning she chose relatively simple commercially available patterns and put her textiles into them. It was of course the hand dyeing on the textiles that gave these early garments their unique appearance, and soon they sold to local retailers. Being resourceful Marian realized that she had a lot to learn about the fashion business, so she joined a group of designers in San Francisco called the Fashion Network. Through this organization she gained friendships as well as advice. In fact Babette Pinsky, of “Babette” fame, became her first patternmaker when Marian decided to develop her own garment designs. The business grew slowly until 1985 when she took on a financial partner. With the infusion of cash she was able to move the business out of her home studio and hire a team of specialists to take care of patternmaking and production under one roof. Hand-dyeing had been the signature of the Clayden garment line, but in the early 1980s she branched out into another direction by designing dramatic prints which were made locally. This enabled the production rate to increase and offered more moderate pricing. Also during this period a unique retail store in downtown San Francisco became a significant factor in the growth of Marian's business. Called “Obiko”, it belonged to a visionary woman named Sandra Sakata. She specialized in the work of local garment and jewelry artisans, and captured the lead in the style trend known as “art-to-wear”. Eventually her reputation spread nationwide, and in 1983 she was invited by the most prestigious fashion store in the USA, Bergdorf Goodman of New York, to set-up an in-store Obiko Boutique. Fortunately Marian's work was included and became one of its best sellers. This exposure, along with Marian's desire to move more into the world of haute couture rather than stay in art-to-wear, began to open doors and her business expanded. 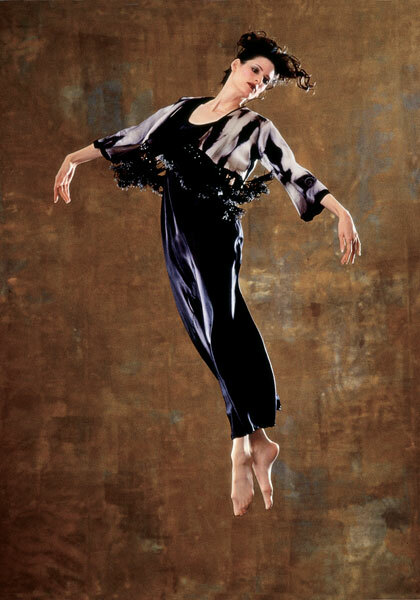 By the mid 90s she was selling to most of the high-end retailers in the USA, along with a few in England and Japan. Her fashion achievements were formally recognized in 1995 when she received the Golden Shears Award as the top designer in the San Francisco area. Always aware that her textiles and artwork were a major part of her success Marian worked closely with fabric mills around the world so that, instead of buying their house products, they would weave or print her own designs. Although Marian had started her business in her home, when it grew too large she moved it to nearby facilities in her hometown of Los Gatos in California. At one point her staff was in the high 20s and coming from 12 different nationalities. Almost entirely women, they all deserve praise for their loyalty and contribution, sadly there were too many to be mentioned here individually. The business with its family ambience thrived through the 90s and into the early part of the next century, but the political turmoil created by the 9/11 disaster had a negative impact on consumer spending and, as with most high fashion houses, sales dropped. Marian tried to augment sales with ventures into fashion accessories and home furnishings. However the business downsized over the next few years until it was impacted by another unfortunate event. 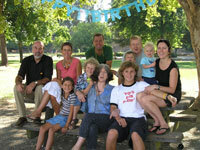 In 2005 Marian's health was affected by what turned out to be a brain tumor. The tumor was successfully removed, but the subsequent radiation therapy to prevent further cancerous growths damaged her brain and resulted in a slow deterioration in Marian's capabilities. Eventually she was forced to close the business and sadly she passed away in September 2015. 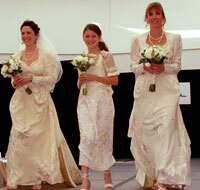 Retrospective fashion show 2008, with Marian's daughter and daughter-in-law in their wedding dresses designed by Marian. Grandaughter Abby is bridesmaid. A Retrospective Exhibition of her work has been touring England since 2014 under the direction of the curator Mary Schoeser, ending with The Fashion & Textile Museum, London in Spring of 2016.� �From there it’s expected to move on to other museums in Europe. 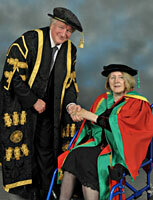 As a final crowning achievement, Nottingham Trent University, where Marian had studied painting in the early 1960s, recognized her achievements and awarded her the honorary degree of Doctor of Art in 2012.